As we go about our daily endeavors, we tend to forget just how instrumental divine intervention is to our ultimate success. Here are some quotes that can help you keep a righteous, God-centered approach as a new day dawns begins. “As a man thinks, so is he,” so I want you to think nothing but positive thoughts as you go out today in search of success! “Those who hope on the Lord will renew their strength.” Good morning, and remember to always keep your faith in God. God morning. I pray that today we’re able to cast aside all bitterness and just focus on how blessed we are to have each other in our lives. “It’s what come out of the man that defiles him,” so today I implore to think only positive thoughts, and I’m sure the universe will bend to your will! Good morning. “Learn from the ant and be wise, who having no ruler or overseer provides her meat in the summer and gathers her food in the harvest.” May you approach today with the discipline, diligence and success level of the ant! Have a beautiful day. I pray that this exceptional morning truly represents a fresh start where all of the mistakes of yesterday will be forgotten, never to burden us again. “Unless you are converted and become like little children you shall not enter the kingdom of heaven,” so I implore you to face today with the joy of life instead of burdening yourself with endless worries. Good morning. “I will show you my faith by my works.” I know that God has something great in store for us, but I also know we have to work to get it! Good morning. The sun is shining, our Lord is smiling. “God so loved the world He gave His only begotten son,” while most of us wouldn’t sacrifice our least child for even the greatest person on earth. 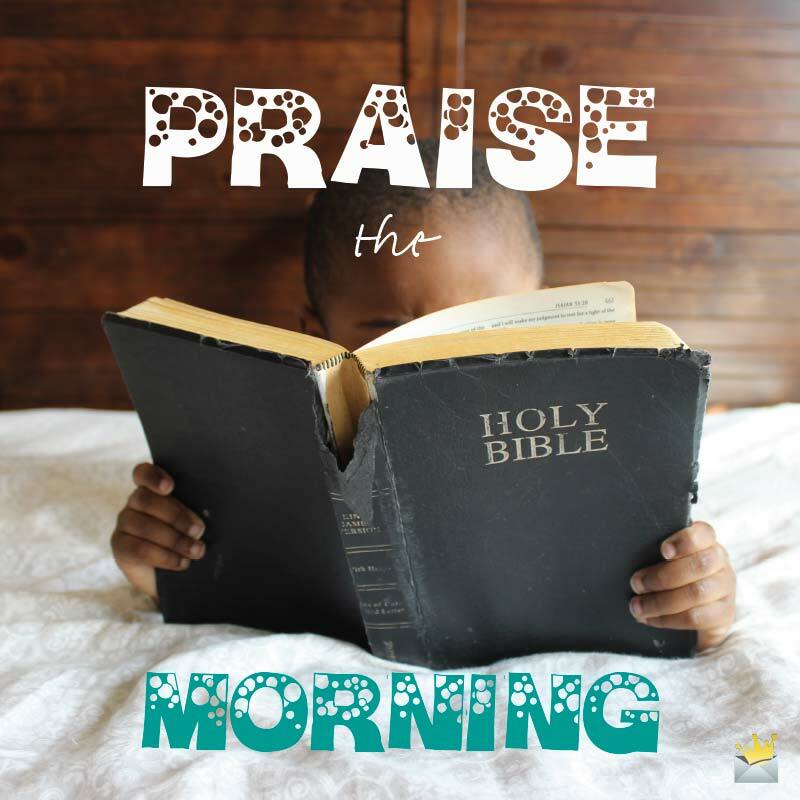 So let’s make our Heavenly Father proud today by proving ourselves worthy of His love! 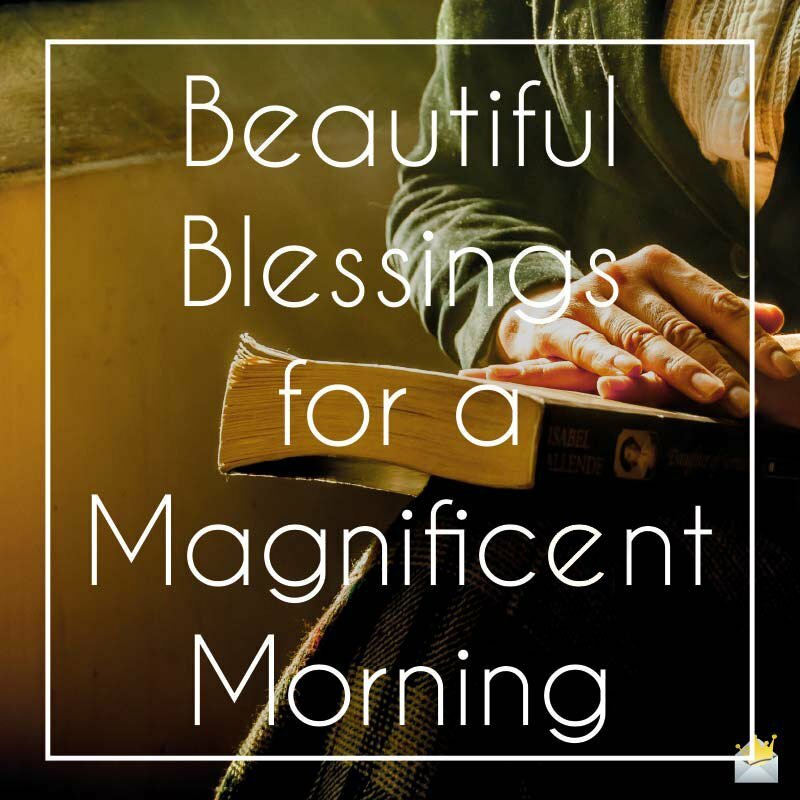 “Each morning everyone gathered as much as they needed, and when the sun grew hot it melted away.” Don’t let your manna spoil – arise early so you can get all out of today that God has provided to you! Good morning. May God be with you as you go through the day. 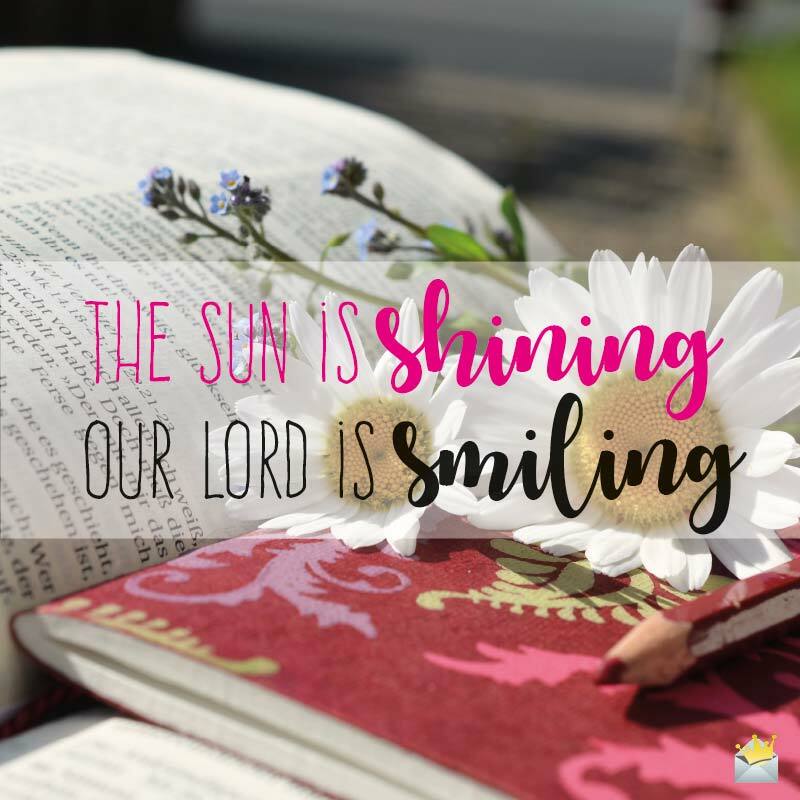 May He grant you your heart’s desires and put a smile on your face. Today, may you blessed with the wisdom of an old man but the joy of a child. May you experience prosperity and the joy that comes along with sharing your blessings! On this blessed day, may the good things of life cover me like the dew has blanketed the earth this beautiful morning. Focus on today, which has its own beauty and challenges, and I’m confident God will make you successful and prepare you for tomorrow. No matter how bleak the day may appear, remember that we serve a loving God who will not only make a way but have us emerge victorious! Good morning. Good morning! May you be blessed today by the direct presence of the most-high God! God has been so instrumental in bringing us this far that I don’t see any logical reason He would abandon us now. So take that confidence and give your all to this brand new day we’ve been blessed with. God has given me everything I need to have a successful, wonderful day, and I’m not going to squander my precious gifts or waste time this beautiful morning! “As you forgive so shall you be forgiven.” Please take these words with you as you start this beautiful day. Good morning. 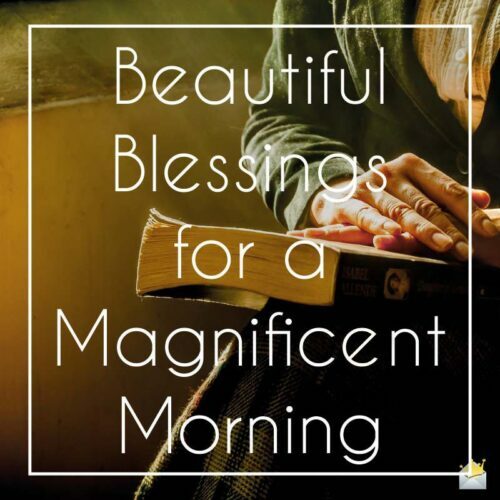 Beautiful Blessings for a magnificent morning. Whether this proves to be one of my best days or one of the worst is largely up to me, but as for God, I know He only wants the best for me and has given me all of the necessary resources to excel. I can’t thank you enough, dear Lord, for this precious gift of life you have blessed me with this fine morning. “Take delight in the LORD, and he will give you the desires of your heart.” Start this wonderful day, knowing that if you invite God into your world, you and happiness will always be inseparable. Like the ‘footprints in the sand’, I pray that Jesus himself carries you over any struggles you may face today. Good morning. Dear Lord, please carry us through this day and fill our hearts with so much joy that we will praise Your holy name even when we don’t intend to. Dear God, please protect me throughout this beautiful day you have blessed me with. Guide my steps and lead me to the peace and prosperity that only You can provide. I pray that God takes the mundaneness of out this day and instead make it one where we achieve something exceptional! Good morning, everyone! Dear God, I appreciate waking up to another remarkably beautiful day worthy of Your presence because even though You don’t speak to me directly I know that You’re there and will always be. I don’t know if God entertains my words, but if He does, my sincerest prayer is that He be with you throughout this day. Have a bright and beautiful morning. Good morning. I pray that the direct presence of God graces you through this blessed day! I pray this day will be so successful that we will feel as blessed when we meet again this evening as we do waking up in each other’s arms this morning. Good morning, my dear. Dear God, on this blessed morning, I ask you to please let everything go my way today, for I desperately need the break! Amen. Good morning. In addition to your business suit, I pray that you will also be clothed with the full armor of God as you go out and once again make us proud! Sometimes we set our hearts so firmly on something as the path to success, only to later realize it was a passing phase. I pray that today God will give me the wisdom to discern the beneficial from the wasteful. Like any contest, the game of life also has rules, and I pray that today you will begin to realize the benefits of following them and experience the success thereof. Good morning.